Most people want personal property, financial security, power and influence, the ideal job, satisfying relationships, a rewarding and enjoyable life. But they have no idea how to attract them into their lives. 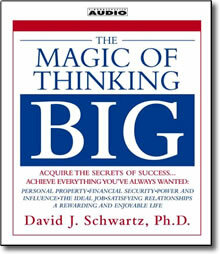 Millions of people throughout the world have improved their lives using The Magic of Thinking Big. Dr. David J. Schwartz, long regarded as one of the foremost experts on motivation, will help you sell better, manage better, earn more money, and — most important of all — find greater happiness and peace of mind. The Magic of Thinking Big offers useful methods, not empty promises. Dr. Schwartz presents a carefully designed program for getting the most out of your job, your marriage, family life, and your community. He proves that you don’t need to be an intellectual or have innate talent to attain great success and satisfaction — but you do need to learn and understand the habit of thinking and behaving in ways that will get you there. This audiobook will give you those secrets!